Choosing the right tile or stone. To choose the right tile or stone option for your project, you must first look at what areas this type of material is going in. If being installed as a backsplash, the popular option is a mosaic. If you are putting it on the kitchen floor, you may want to look a hardwood look that is actually tile. This is going to give you the durability and water resistant that you want in the kitchen while still getting that hardwood look. Today, there are more styles than ever. From hardwood to marble looks, modern to rustic, you can find the style you’re going for with our tile & stone selection. 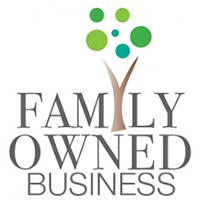 Our knowledgeable non-commissioned staff is here to help guide you in the right direction. 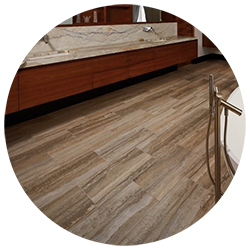 Coming in a variety of hardwood looks, marble looks, stone looks, and tile looks, porcelain tile is the most common tile or stone used in the industry today. It’s important to note that all porcelain is ceramic but not all ceramic is porcelain. Specifically, porcelain is ceramic that has lower water absorption due to a denser body therefore it can be used for outdoor applications. Made from clay and minerals, porcelain is fired at extremely high temperatures, becoming 30% harder than natural stone (like granite and marble). Hard, dense, and durable! 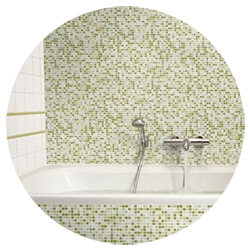 Mosaic tiles are perfect for shower floors or installing a decorative backsplash in kitchens and bathrooms. Most glass tiles come in a mosaic option with vibrant colors with reflective material to provide a distinctive appearance. Travertine is often visibly porous, giving it a more natural, textured look. However, when sanded down and sealed, travertine tiles are smooth and suitable for flooring or as shower tiles. This stone is relatively soft and absorbent, so it requires a few coats of sealant to prevent debris from penetrating the stone. 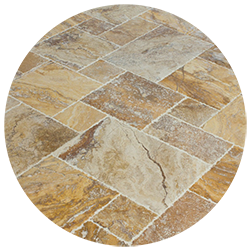 Travertine’s colors are typically warm and range from the lightest white or cream to beige, gold, brown, and even red. Slight color and pattern variations between tiles keep them from looking too uniform. Often you see travertine looks in kitchen and bath areas. 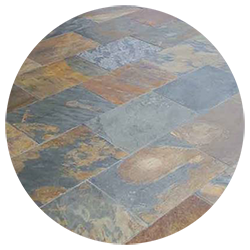 There are innumerable colors and multi colors available when choosing slate floor tiles. This is enhanced by the fact that all features found in these materials are natural, and thus occur in unique ways across each individual piece. That means that every floor produced is a one of a kind work of earth-born artistry. You can tell marble apart from other stone tile by its hardness and distinct veiny color patterns. Although marble is sometimes a single, solid color, more often it is one color with streaks of another running through it, such as white with gray or black veins.Marble is a versatile natural stone that creates a luxurious and unique look. For over 60 years, Florida Tile has consistently taken the lead as an innovator by implementing new technology, delivering high quality products and protecting our indoor and outdoor environments. With a full line of mosaics, porcelain and ceramic wall tile, as well as natural stone and decorative glass and metal tiles, Florida Tile offers a tremendous selection. Browse their idea book for some inspiration for your project. 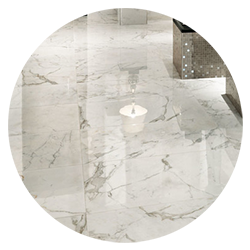 If you’re looking for luxurious imported porcelain tile for your project, then look no further than Happy Floors for the best place to find what you need. Ninety percent of their premium tiles are imported from Italy, with the other 10 percent coming from Spain.